Home News In storm-filled finish, MHS drone team soars to 2nd in U.S. 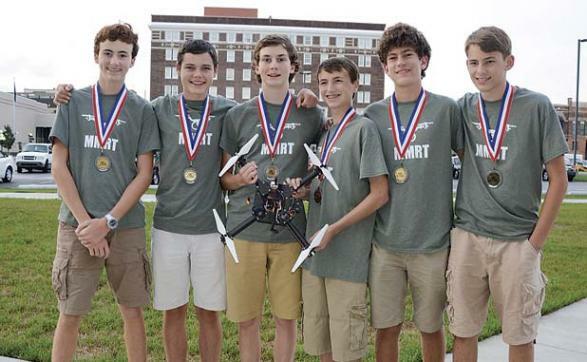 In storm-filled finish, MHS drone team soars to 2nd in U.S.
A team of sophomores and freshman from McIntosh High School in Peachtree City competed against the best in the nation to win second place in a drama-filled drone challenge in Muncie, Indiana, Aug. 20. 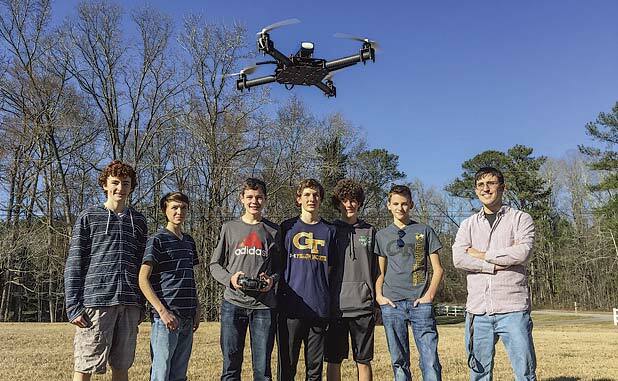 In a near-photo finish, the Peachtree City Droners at McIntosh High were fewer than 3 meters away from first in the nation in their first small Unmanned Aircraft System (sUAS) national competition. Not only did the team finish second in the nation, but it was also their first year of working together. The team members are Robbie van Zyl, Parker Korn, Marcus DiBattista, Ian Buckalew, Andrew Walter, and Matt Harmon. “Congratulations to this team that lived up to the school’s pursuit of excellence,” said Stacey Smith, McIntosh High School assistant principal. The McIntosh MultiRotor Team stepped onto the flight line amid worsening weather conditions which included 15 mph winds and gusts of up to 20 mph. Weighing heavily on their minds were that these same conditions had just taken its toll on two other teams resulting in one lost drone and one crash landing. Earlier in the day, a team from an aviation high school in Seattle sponsored by Boeing had performed an almost perfect mission, as had a team from a STEM high school in Minnesota. The MHS team knew it would all come down to how well they handled the pressure and the weather conditions during the next 45 minutes of their mission attempt. The prestigious UAS4STEM contest was designed by the Academy of Model Aeronautics (AMA) to introduce students to the positive impact that drone technology could have on our future and to provide a program for students to learn about the technical intricacies of autonomous drones. The contest requires teams to build and customize a drone and to learn how to configure and program the drone to perform autonomous missions. The drone could be programmed to fly missions on its own from a ground station computer connected by a radio telemetry uplink while the team monitored a live video feed transmitted by the drone to a screen on the ground. The challenge was to search and locate and identify hidden objects in a designated search area. Teams are judged on their ability to find all the objects and accurately report the GPS coordinates of each object. The mission this year was life-or-death challenged based on finding a lost group of hikers in a remote area before a major storm would consume the area. Little did the organizers realize how realistic the premise of the contest would turn out to be. Back on the flight line, the team, composed of Robbie van Zyl, Parker Korn, Marcus DiBattista, Ian Buckalew, Andrew Walter and Matt Harmon, realized that the months of preparation and practice would come down to the next 45 minutes. What they did not know at that time was that they had scored highest of all the teams on the flight readiness briefing — a presentation to judges of how they have modified the drone for the challenge and how they plan to approach the mission. However, the entire mission could not be autonomous. During the process of locating the objects using the precision onboard GPS, Matt Harmon, the team pilot, had to take manual control of the drone. “The stormy conditions we experienced were more challenging from a pilot’s perspective than any thing I’ve flown in before,” Matt said. Less than two minutes before the end of the allotted time, the team was still searching for the last “missing hiker.” Despite being very low on battery, they decided to make one final search attempt in an area they had not previously searched. Their excitement as they spotted the last missing hiker was sobered as they realized that they were critically low on battery and had less than two minutes before returning to base. After tagging the location they sent a “return to base” command. Less than 100 yards from the base the drone’s battery reached a critical voltage level and the team initiated a controlled emergency landing. Fortunately, the drone was close enough to base to be recovered, and Parker Korn and Andrew Walter had less than 60 seconds to run out to recover the distressed drone. The team had just completed a perfect mission and the first place in the contest came down to the young McIntosh team and a team of upperclassmen from Minnesota. In the end, when the final position of the objects were compared, the Minnesota team’s superb mission narrowly edged out the McIntosh team. On two of the objects the McIntosh team had missed the actual location by less than three meters. The team was one of 11 from middle and high schools across the country that competed in the first National UAS4STEM competition sponsored by the Academy of Model Aeronautics. The program is designed to encourage students to learn about the sUAS (drone) phenomenon through teamwork, competition, and success through STEM (Science, Technology, Engineering, Mathematics). The competition was held at the International Aeromodeling Center in Muncie, Indiana on Aug. 20. The team qualified for the national competition after winning their regional competition earlier this year. A total of 75 teams took part in regional competitions across the nation, with only 11 of them advancing to the national event. The UAS4STEM competition is a search and rescue challenge. This year’s mission was for each team to use a sUAS to support a search and rescue mission for a small group of hikers who went missing in a remote area. All competitors were required to complete the sUAS ground school curriculum and work together to build a Quadzilla quadcopter.